This is the story of dreams, creativity and thwarted ambition. Once upon a time, back in the swinging sixties, on the north side of London’s Soho Square, there was a bright green townhouse that was the home of some of the city’s most wonderful eccentrics. 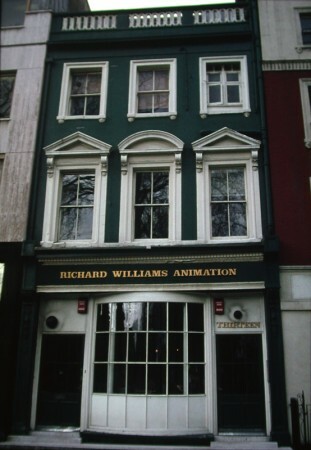 It was an animation studio run by Richard Williams, whose psychedelic art style caught the era’s zeitgeist and became hugely popular. The kindly, affable and vaguely other-worldly Williams wandered about his studio directing his animators and painting key frames in vivid rainbow colours, creating an astonishing range of movie sequences and commercials. His title credits for the ‘Pink Panther’ films, ”What’s New Pussycat’ and ‘Casino Royale’ (the original) were wonderful (he won Oscars, notably for ‘Who Framed Roger Rabbit?’) and I loved his sequences in ‘The Charge of the Light Brigade’, which explained the Crimean War in the form of a series of political cartoons. One day I had to go there to brief some animators on the making of a commercial, and Mr Williams excitedly showed me around the studio. He was bringing over animators from Disney to pass on their teaching to his staff, and introduced me to the legendary Ub Iwerks, who hand-drew the first Mickey Mouse cartoons. He was very old (I believe he hand-drew the dancing mushrooms in ‘Fantasia’) and was effectively passing on his knowledge before he died. Williams had a secret passion – he was working on a feature film of his own in his spare time. It underwent many titles, and was shot wide-screen, utilising every possible visual trick in the book. It eventually became known as ‘The Thief and the Cobbler’. Back in the 1980s (and again in the 90s) I did some marketing work on this unfinished masterpiece. The problem was that the film – based on Persian miniatures and the writings of Sufi philosopher Mullah Nasruddin – was an insanely intensive labour of love that predated CGI, and was eventually overtaken by it. The version I worked on had Vincent Price, Kenneth Williams and Eartha Kitt among its voice talents. It followed the story of a cobbler who fell for a princess and became involved in a war that broke out after a thief stole three golden balls from the top of the palace tower. The work was to be the climactic peak of animation – but Williams couldn’t bring himself to leave sequences alone. The project became ever-more elaborate and ornate. It became something he could never finish. And while the characters of the silent thief and the cobbler were charming, he lost sight of who the film was intended for – not children, certainly; it had become far too baroque for them. Meanwhile Williams continued to use commercials and film credits to try and finish the film. Various studios helped him, offering financial encouragement to complete the feature. Warners took it for a while, and were horrified to discover that, far from being almost finished, as Williams had told them, there was less than three quarters of an hour of footage. But Warners are tough task-masters. When Williams went over deadline yet again the insurers moved in, took the film away from him and closed his unit down. They were worried that Disney’s ‘Aladdin’ would kill their market, although the films couldn’t have been more different and this was probably just an excuse. The existing 43 minutes were expanded and eventually cobbled together in a terrible, embarrassing mash-up version from Miramax, who destroyed the remaining interest in it. Williams’s studio folded. In 2006, a filmmaker, animator and fan of Williams’ work named Garrett Gilchrist created an unofficial DVD titled The Thief and the Cobbler: The Recobbled Cut, featuring a restored version of the movie he edited himself based on Williams’ original workprint, mixing the original audio track, finished scenes from the released versions, pencil tests, rare footage and pieces of the storyboard. Williams has never officially commented on the restoration. ‘The Thief And The Cobbler’ is the greatest animated film never to see the light of day in its intended form. The little green house on Soho Square is still there, though. Animated films are not what they were, apart from gems like ‘The Illusionist’ Present-day computer-created work rarely has the charm of the hand-drawn Disney creations of the 40’s and 50’s.I reckon the last great one was ‘101 Dalmations’ where you could almost see every pencil line. I would love to see the film, despite how short it is. I enjoy stories about the Mullah. Folk wisdom and ethical tales and funny! The ultra-orthadox do not like Mullah Nasruddin stories! Sufism says: “Treat the rich and powerful like common people and the poor and suppressed like royality.” That doesn’t stop the stories being told out of the side of the teller’s mouth. There is a strain of “sufism” in all the world’s religions, even in Native American trickster tales, just as there is a smart mouth in every society. Idris Shaw, an Afghan who lived in Britian, gathered together Nasruddin tales in two books and they are probably still available. I may have typed one here about Mullah N. riding backward on his donkey, so he could see where he’d been and not repeat the past. While in Afghanistan, which has/had a large Sufi community, I liked to ask people to tell me their favorite Mullah stories (the reworkings were most interesting). I soon also realised just how many tales there were. I even dared to try out some “originals” myself on the fly, just to keep people talking, and most went over rather well. Dan, you can find the whole extraordinary film on YouTube, but the quality isn’t very good. I recommend dipping into the Escher-esque chase scene a third of the way through. Did he have anything to do with Yellow Submarine or did the creators of that get some ideas from him I wonder? I saw The Charge of the Light Brigade many years ago and can still remember that sequence. I can’t wait for Film Freak to wallow in other similar stories of Soho and admins’ various escapades..
Chris, when on earth are you going to make it to Seattle? You have quite a cabal here in the Pacific Northwest. I’m enclosing a recent article on the continued assault of tech into Kings Cross.